A crumbling castle to explore? Check. 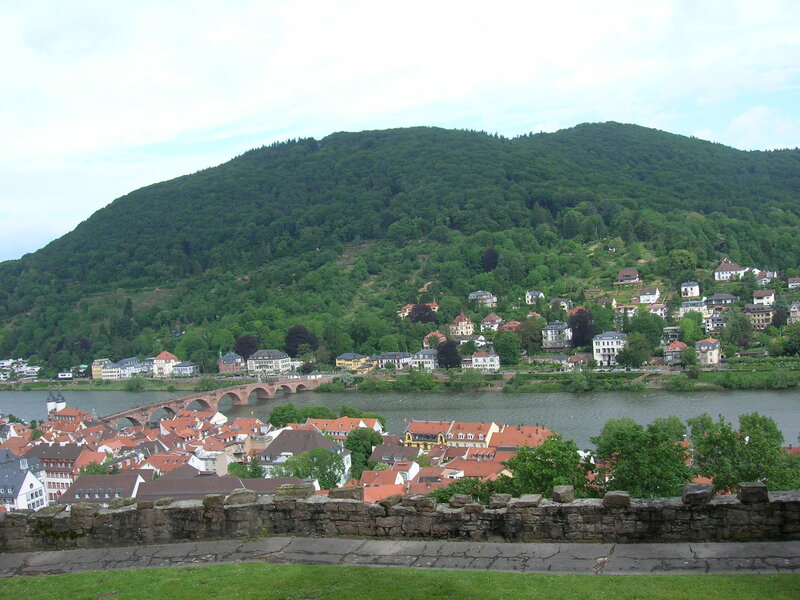 Situated in a valley right along a wide river and full of green hills so that it looks you’re in the middle of forest? Check. A romantic bridge to stroll across? Check. 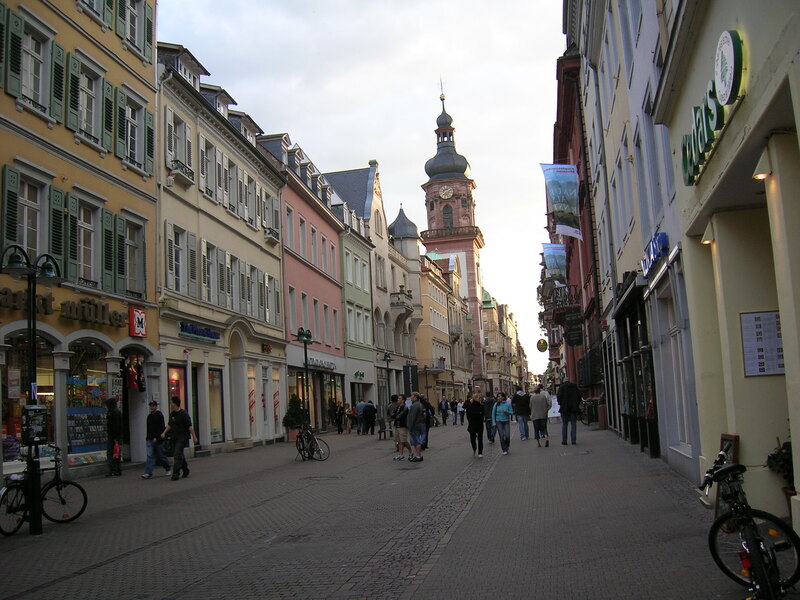 A baroque-style old town full of wonderful restaurants and quaint shops, as well as modern stores? Check. A university that imbues the area with youthful energy and creativity? Check. 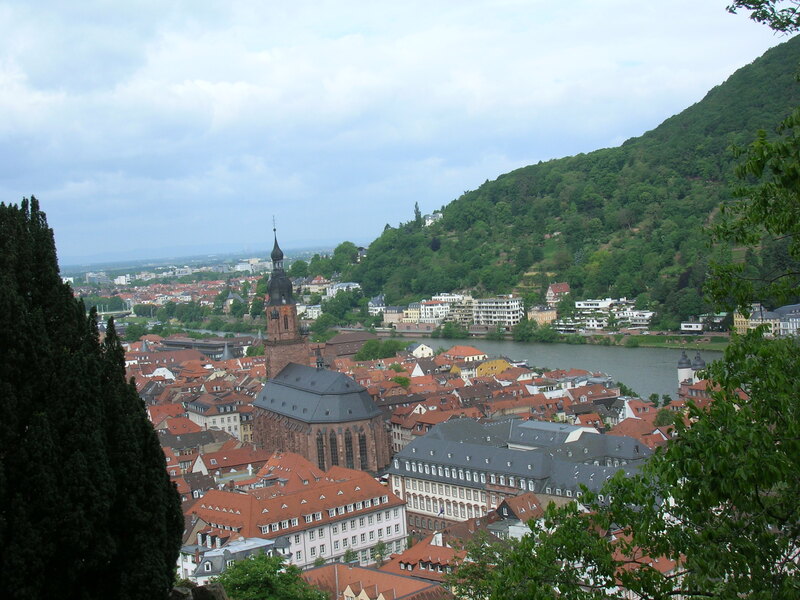 With all of these to offer, it’s no wonder that Heidelberg, located in south-west Germany in the Rhine-Neckar region, is one of Germany’s most touristed cities. It’s so popular that many people say it’s too commercialized, crowded and touristy to enjoy. Indeed, over the summer you do find groups of tour bus tourists (I heard and saw a lot of Japanese), but I didn’t find it nearly as bad as other tourist hot spots I’ve been to over the summer such as Venice and Florence. 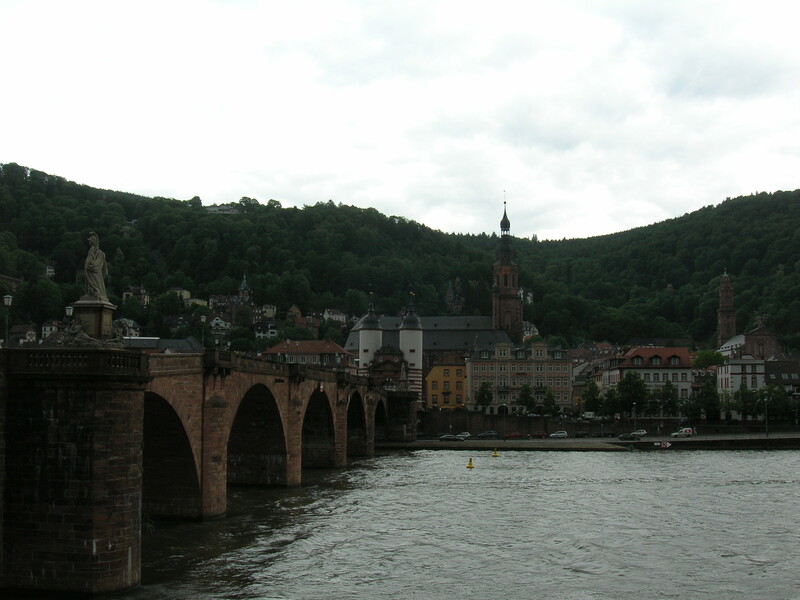 I actually LOVED my time in Heidelberg. We set off from Hubby’s family residence in the Netherlands. 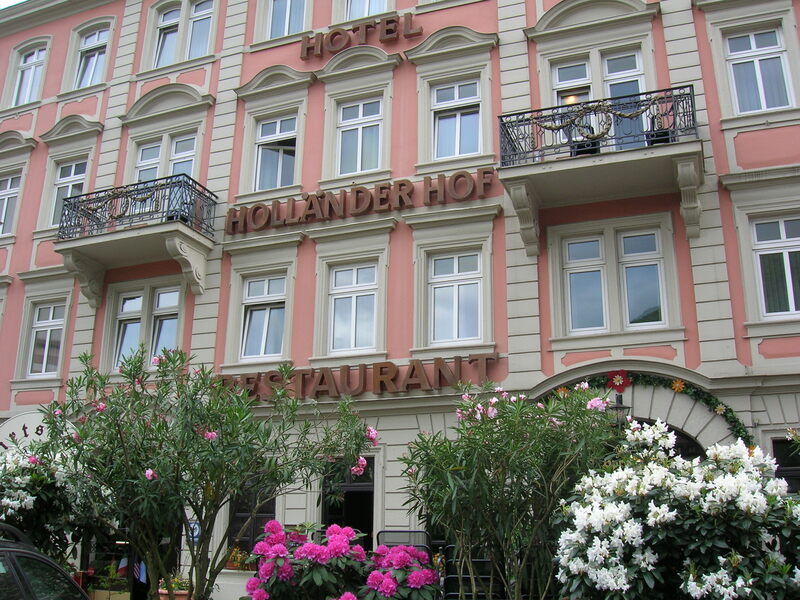 After a few hours in the car, we arrived right at the door step of Hotel Hollander Hof. 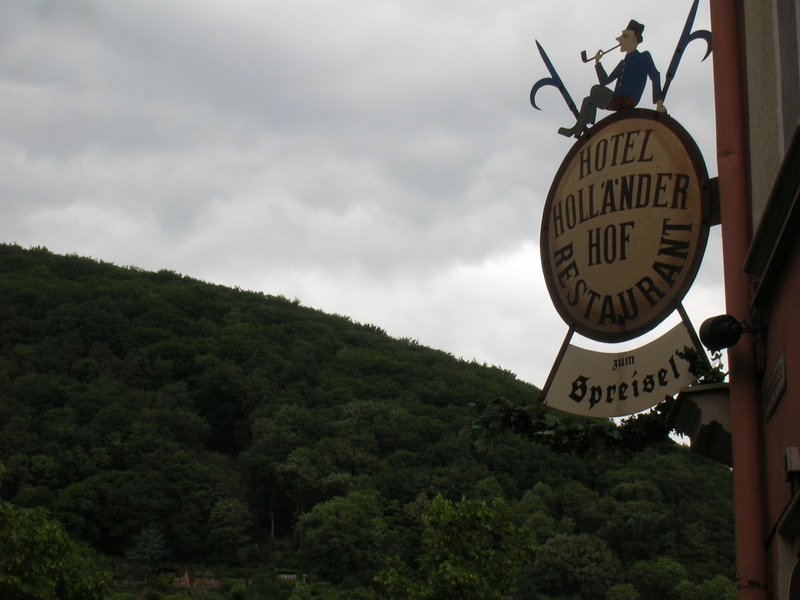 No, we didn’t choose the hotel just because t he Hollander liked the name, but because it’s located right across the old bridge and within walking distance of everything you want to see and explore in Heidelberg. As we’ve found with many of the other places we’ve stayed at in Germany, the hotel was reasonably priced, with friendly service, and comfortable and clean. There’s a restaurant on the lower level, which we didn’t try but looked quite packed whenever we walked by. 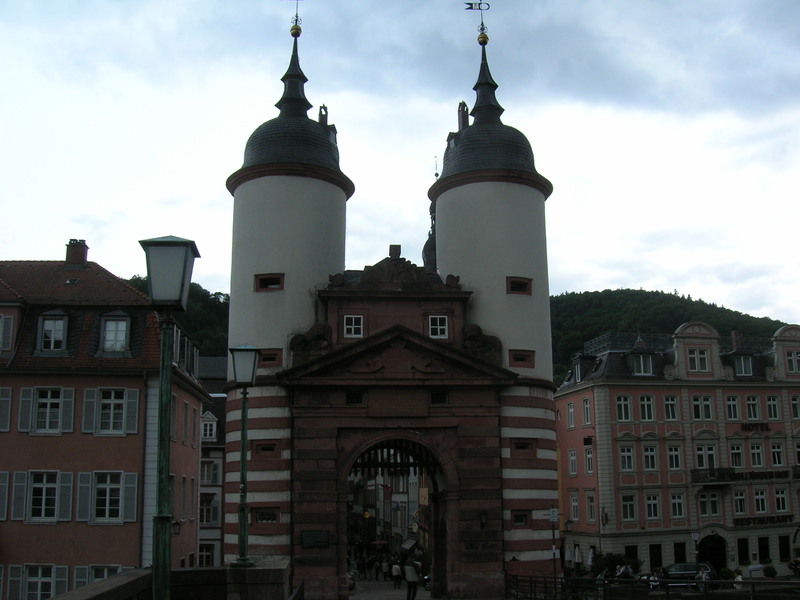 As you can see, the hotel is literally right across the gate entrance to the Carl Theodor Old Bridge. It was nice being able to get up, grab some breakfast, and walk leisurely across the bridge enjoying views of the water, city and landscape in the early mornings. 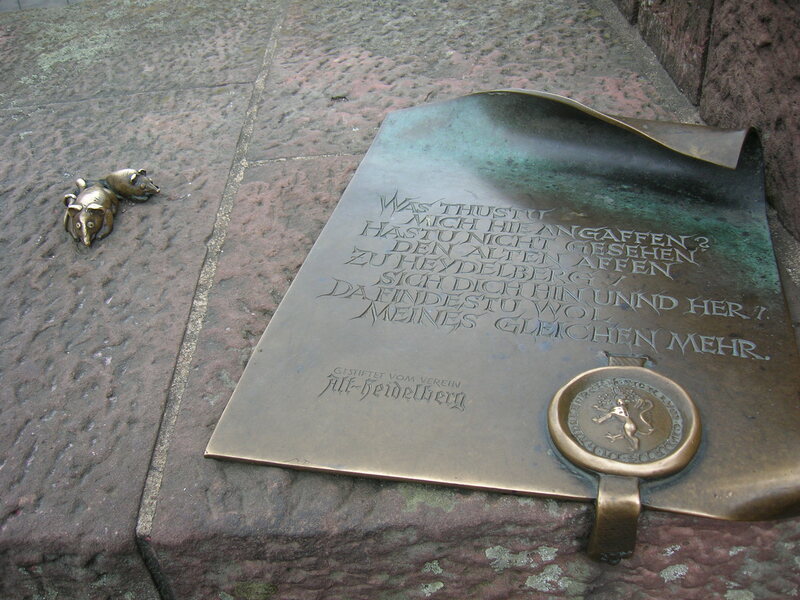 There is a funny giant monkey statute (not pictured) and plaque next to it with what looks to be a riddle or poem on it. Lends quite a whimsical feeling to the bridge. 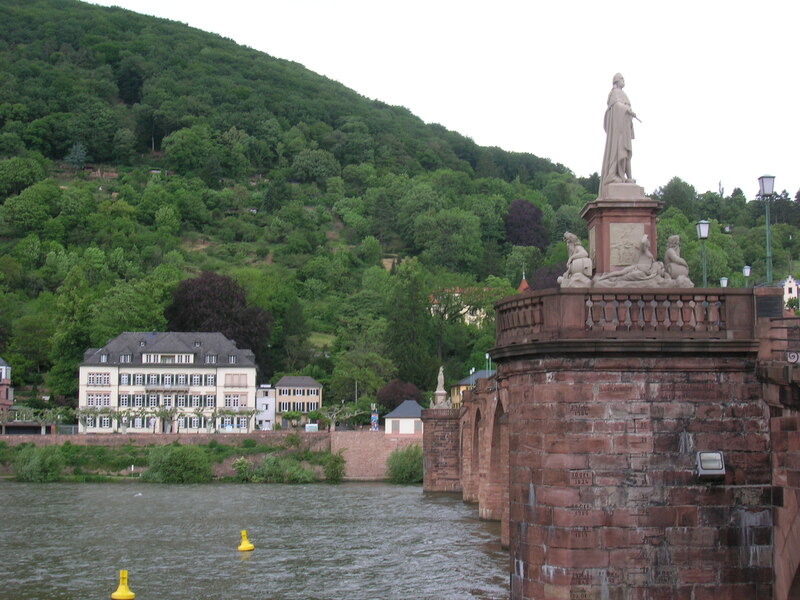 Once on the other side of the bridge, you can hike (the “Philosophers Way” trial which takes you all the way up for great views of the castle and leads you to Hitler’s open-air amphitheater and The Abbey of St. Michael is popular), or just stroll along the riverbank. 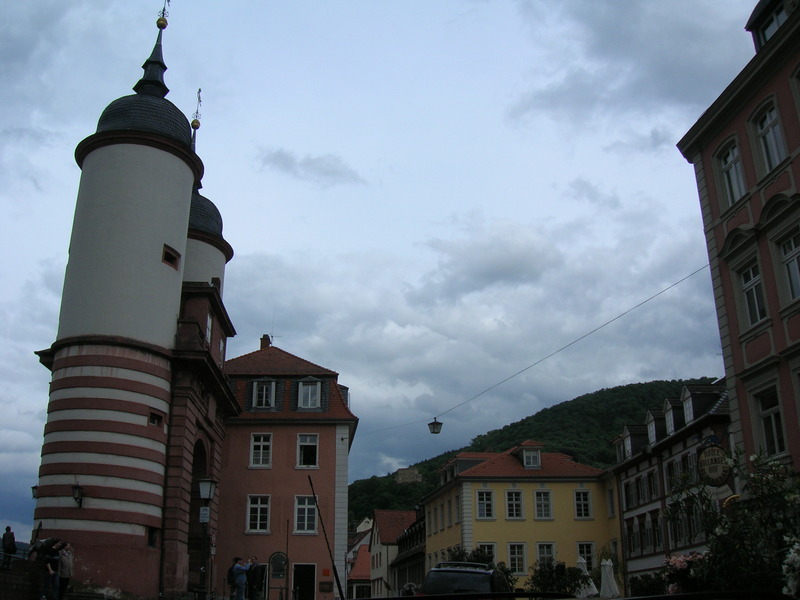 Back across the river, there’s old town and the main shopping street, Hauptstrasse, to explore. 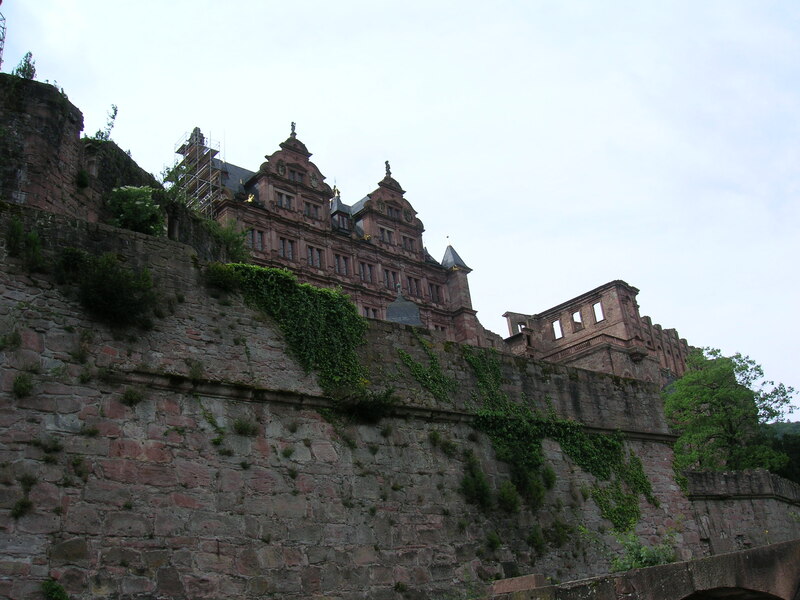 We hiked up to the Heidelberg Castle (easily done), from where you get wonderful views. 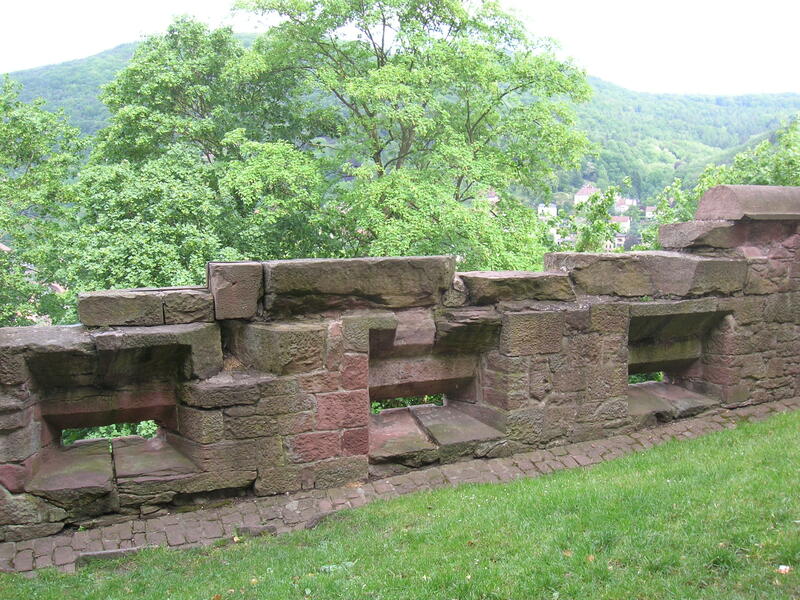 The castle was slowly built upon through the years starting before 1214 AD. 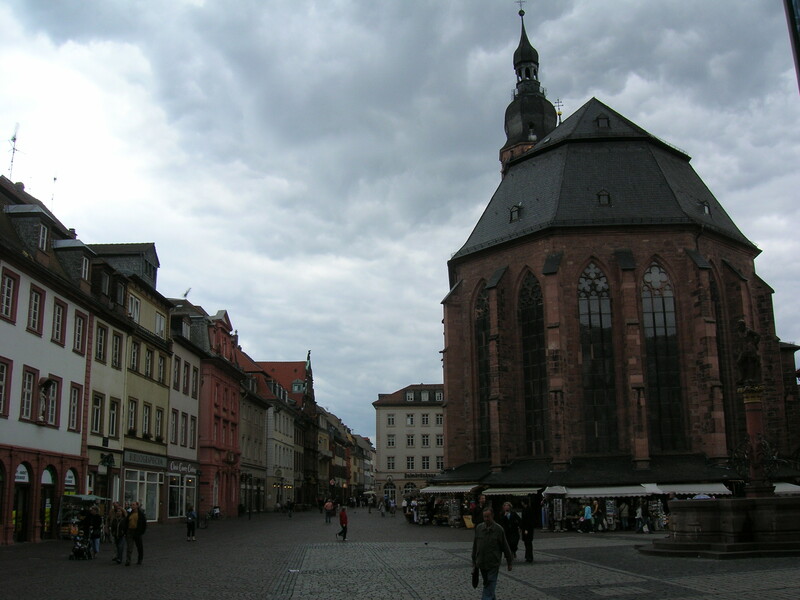 It was demolished in the 17th and 18th centuries, then partially rebuilt in subsequent years. The castle’s history is so long and tumultuous, with destruction by lighting bolts and wars, and its famous residents so varied, including a king, princess and artists, that it’s almost impossible to take it all in. We spent quite a bit of time just take videos of the views below. We also explored the castle courtyard, the cellar with the giant barrel, gardens, and German apothecary museum on our own. Watch out for an arrow! 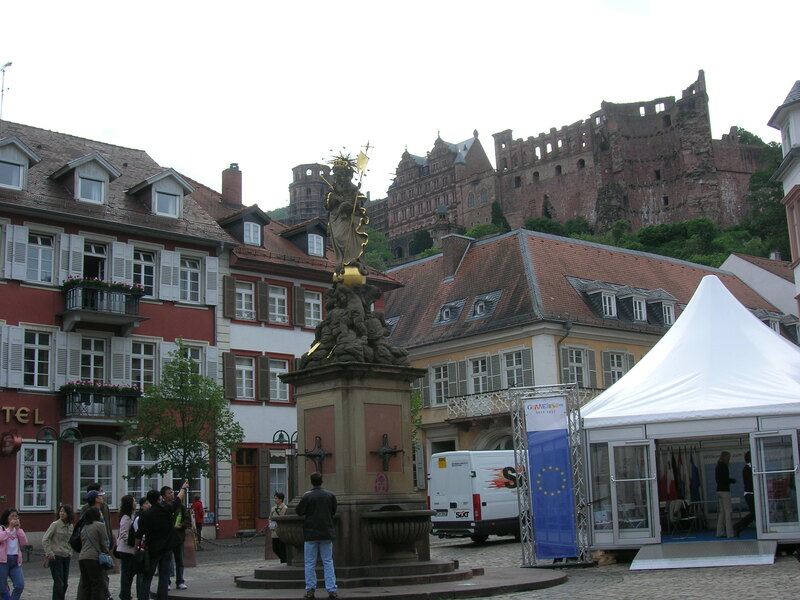 What we loved doing most in Heidelberg was walking around at night, just absorbing all the sounds and sights. The castle and bridge are all lit up at night and the orange glow reflected in the waters is just so romantic. The presence of the university guarantees that there’s always something to do. Walking around one night we heard a group of boisterous young people singing along wildly to Blur’s “Whoo hoo” in a dark and hidden bar. “Whoo hoo!” “Whoo hoo!” they yelled at the top of their lungs. I was too intimidated to walk in. Sometimes, I wish I wasn’t so shy. When else will the chance to yell along to such a silly song with big German men, in such a picturesque city, come again?